As we anticipate the biggest students & youths award; Nigeria Hype Awards, we present to you, the Nigeria Hype Awards Theme Song Contest. 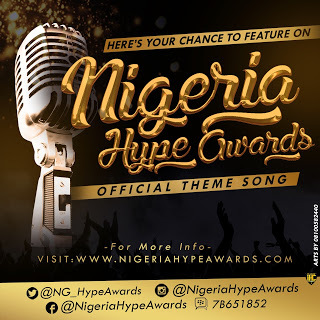 The Nigeria Hype Awards Theme Song Contest is an online competition for talented singers and rappers. The best 3 artistes will be selected to record the official theme song for Nigeria Hype Awards. Winners also becomes Nigeria Hype Awards Ambassadors and gets free tickets to the grand finale of Nigeria Hype Awards. a.) Your song must conform with the aim of Nigeria Hype Awards which is all about celebrating Nigerian students & youths. b.) Use of offensive and vulgar lyrics will not be tolerated. For more enquiries: Call: 08165927066, 08135503312, 09092027252.